President-Elect Barack Obama gave a major economic address today at George Washington University, urging Congress to quickly pass his economic recovery plan. The American Recovery and Reinvestment Plan he is proposing hopes to create or save 3 million jobs over the next few years and spur economic growth as the economy continues to slide. This speech comes one day after reports saying the government would run a $1.2 trillion deficit. The plan will expand government spending even further through a combination of public works projects and government investment into specific industries. Throughout the speech, which was directed to Congress, Obama stressed the urgency of this particular plan, hoping to get this plan passed before his Inauguration. Festivities surrounding the Inauguration can tend to delay Congressional actions. Obama, with this proposal, seeks to save or create at least 3 million jobs over the next 3 years by investing in health care, education, and energy. Most of the new jobs will be created in the private sector, in industries like energy. 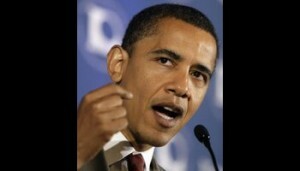 Building solar panels, windturbines and creating energy efficient cars are jobs that Obama said “cannot be outsourced”. The plan seeks to save jobs in public sector for teachers, fire fighters and other public servants. Obama is also proposing that within 5 years, all medical records be computerized because it could save jobs, money and lives by providing a consistent standard for personal medical information. He also proposed investing in new computers, classrooms and training for teachers to make our students more competitive and an expanded electricity and broadband infrastructure. Additionally, in order to get people spending again, 95% of working families would get a $1000 tax cut under the plan.. In his speech, Obama also criticized corporate leaders and politicians whom he blamed for putting the country into its current financial state. “This crisis did not happens solely by some accident of history or some normal turn of the business cycle.” We arrived at this point due to an era of profound irresponsibility from the corporate world and politicians looking to score political points with corporations. Economic Stimulus: Where Will Jobs Be Created?